Hey, have you heard Jeff Loomis’s solo album, Zero Order Phase? It’s intense, like Strapping Young Lad meets Cacophony. Loomis has some serious chops and his signature Schecter 7 string seems to be one of the hottest guitars out there at the moment. (West Haven, CT., July 23, 2009) – Rock House, the leader in music instruction, announced today that one of this era’s most influential guitarist Jeff Loomis, has joined Rock House’s roster of master instructors. Jeff is the lead guitar player and main songwriter of Nevermore, a band that has certainly made its mark on modern music by forging a unique sound that fuses different forms of Metal that has given birth to an authentic and very influential style. His recent solo CD Zero Order Phase took the #4 spot in a April 2009 Guitar World Magazine Readers Pole in the Best Shred Album of the year category. A notable accomplishment when you consider the top three vote getters, Paul Gilbert, Yngwie Malmsteen and Joe Satriani. Jeff has become one of his generation’s most recognizable guitarists and the source of many of the last decade’s best riffs. Jeff’s complex shredding has been a central part of the progressive power guitar scene since 1992 and is responsible for some of the most awe-inspiring riffs modern metal has ever heard. 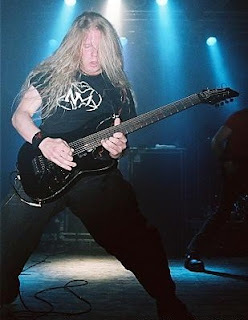 Nearly every aspiring musician who has been listening to metal for the past 10 years or so, has undoubtedly had the pleasure of hearing Jeff Loomis’ progressive and technically superior playing. “Jeff epitomizes the very essence of modern guitar playing; there is a huge fan base that has waited a long time for this type of product from him.” Stated Joe Palombo, Executive Director of Rock House. At least two instructional DVDs showing the building blocks that make up his signature sound are planned. Production on his Rock House products are slated to begin late the first week of August, no exact release dates have been set at this time, however, it is likely to be some time in the fourth quarter of 2009 or the first month of 2010. Stay tuned to www.RockHouseMethod.com, www.JeffLoomis.com and http://www.myspace.com/jeffloomis for more information on release dates. Jeff’s Rock House instructional products will be available at MI retailers around the world for $24.99. Stay tuned at. All Rock House instructional products are distributed through Hal Leonard Corp. 1-800-554-0626. 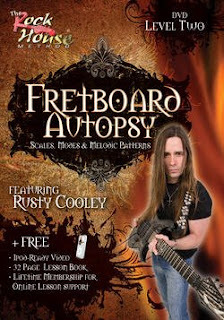 Each on of Jeff’s DVDs will come with a FREE tab lesson booklet, iPod ready video and membership to Rock House’s lesson support site at www.RockHouseMethod.com. This feature, exclusive to Rock House and its partners offers students supplementary support for the lessons featured on the DVDs. Rock House has developed an accelerated yet easy-to-use system of learning that utilizes the functionality of DVD and Print, integrated with the accessibility of the Internet. Aspiring musicians who have a product produced by Rock House receive free membership to www.RockHouseMethod.com for 24-7 lesson support. Students use this fully interactive site along with their product to enhance their learning experience, expand their knowledge, link with instructors, and connect with a community of people around the world who are learning to play music using The Rock House Method®. CLICK HERE to buy the Schecter Jeff Loomis C7 FR 7-string Electric Guitar Vampyre Red Satin from Musician’s Friend for $999.